Health of our immune system tells how long can we live and if that life will be healthy or not. Usually we don't take care of our immune system and only care for it when we are suffering from some disease. Its a strange fact but true that "We notice our body only when its unhealthy". When we are healthy we don't notice it. You might have not looked at the fingers of your foot from a long time, as if they were not there. However they worked continuously for you. We only notice them if they are hurt or wounded. To be frank, its not a bad thing. Its a sign of a healthy body that we don't notice it. Because our mind is made to notice it only when its in pain. So don't get into more philosophy and make your immune system better so that it can keep your body free from diseases and painless. What is our Immune System ? Our Immune system a mechanism in our body to fight against diseases and any any foreign element. Our blood contain Lymphocytes (White Blood Cells) which fight the micro-organisms that can harm our body. These Lymphocytes die themselves after doing their job or after a certain expiry time. Scientists known the minimum amount of Lymphocytes that should be present in our body, but their optimum number is not yet known. According to some researches our body automatically generates more Lymphocytes when there is a urgent need for them. You can't say that only Lymphocytes are Immune system. Our Bone marrow generates blood and Lymphocytes are created there so it is also a part of our our immune system. Our Kidney filters our blood and its also a part of immune system. Our Nostrils also filters the air that we inhale and the dust and other micro-organisms stick to the moist surface, thus defending our body. Similarly tear glands in our eyes keeps wetting our eyes so that our eyelids can wipe-off the dust from surface of eyes, it not only keep our eyes clean but also protect us from several micro-organisms. All these things create our immune system. Taking care of only one thing can't keep our entire immune system strong. All systems in our body are interconnected. 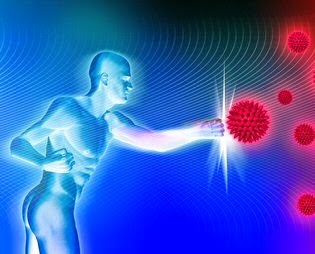 We need to strengthen our entire body to make our immune system healthy. Its not necessary to do power lifting or workout in a gym. Exercises like running, jogging, swimming and aerobics can also keep you fit. It increases your blood circulation make you sweat. Sweating is also necessary for a healthy immune system. You may also opt for some sports activity if you don't want to exercise. There is nothing new in this. Healthy diet is must for a healthy body. Deficiency of any vitamin or mineral can make you sick. You also need to have protein, carbohydrate and fat in the right amount. Stress is the worst disease as it kills you from inside. Here inside means that it damages your ability to think properly and affect your day-to-day activities. It may also affect your sleep. Smoking is like ingesting gaseous poison yourselves. Its the worst bad habit for health. Mild amount of Alcohol is not harmful but being alcoholic is harmful. Consumption of alcohol reduces your ability to think properly and increases your reaction time. It means that your reflex-actions are delayed. Unnecessary medication reduces the natural ability of your body to fight against diseases. In other terms it makes your immune system weak. Medication should be used as a supporting hand to your immune system, not as a replacement of immune system. High dosage of medicines make the micro-organisms to adapt and becoming more powerful. Thus making you more prone to getting sick. Especially antibiotics should be taken in mild amount. Weight plays an important role in your health. Being overweight means that your immune system in weakening. It also make you prone to High Blood Pressure and Diabetes. After the age of 40 you should get you blood pressure checked regularly. High or low blood pressure for longer durations can impact all systems of your body. Sleeping like a child means sleeping stress-free. You can have a deep sleep only if its stress free. A good sleep is necessary for your body to repair itself. It also saves you from a number of psychological disorders. Last but no the least "Meditation". Meditation is known to have a number of positive impacts on body. Some people believe that your chances of getting ill are highly reduced if you practice meditation regularly.